Dress up your living room, office, or sitting room with this sophisticated sofa, complete with two fringed toss pillows. Made in the United States with a solid hardwood frame, this design is covered in solid-hued polyester upholstery and filled with polyurethane foam. 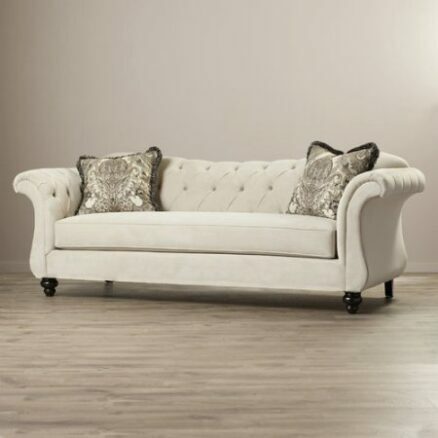 Crystal-like acrylic buttons outfit its tufted back and sides for a touch of glamour, while flared arms and black-finished turned legs give it a traditional look. This piece requires some assembly and fits through a 40″ W doorway opening.